Many elderly couples engaged in estate planning feel like joint ownership of the estate with one of their children makes the most sense because property owned jointly with rights of survivorship will avoid probate and they will automatically transfer to the joint owner upon death. The expectation is that that particular child will then share the jointly held property with their siblings. However, there are a number of ways joint ownership can thwart one’s estate plan. For instance, where part of the estate plan was to equally provide for all of the children and not just one, the joint owner frequently ends up getting a lot more than the other children, who can even sometimes get nothing at all. 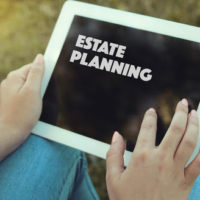 Working with an experienced estate planning attorney can help you look at the pros and cons of different estate planning techniques, including a transfer on death account or a trust. It is the attorney’s job to run through the tax consequences and the impacts on your family associated with various techniques. Another common circumstance that might shock you is how many people die without a will or living trust (i.e. “intestate”) each year. This means that state and local laws determine who inherits your property and who manages your estate. It can also involve additional expenses in the administration and distribution of your estate, such as surety bond premiums and the expense of setting up guardianships for beneficiaries who are minors. Another mistake many couples frequently make is not planning for how one’s health care decisions will be made, should they become incapacitated. Again, without establishing health care proxies and durable powers of attorney, local and state law will determine who makes these decisions for you and unnecessary expense will be incurred for guardianship proceedings. Another common mistake is assuming that estate planning can be done via filling out generic forms online. Remember that you need to fill out the right form, for the right jurisdiction, and the documents must be executed correctly as well. If anything is wrong in any one of these categories, the will or other document may be invalid and your property may not be distributed as you desire. It is never too soon to start your estate planning. Your goal is to ensure that your family is properly provided for without causing conflict; this means understanding all of your options and seriously considering the pros and cons of each one with an experienced estate planning attorney. Contact one of our Sarasota estate planning attorneys to learn more about what Moran, Sanchy & Associates can do for you.